Superannuation has been a very touchy subject for the past few weeks, but it is a topic that is not going to go away for a long time. Labor has been roundly condemned from nearly every quarter, including from within it’s very own ranks, for their very transparent efforts to link super to yet another round of attempted class warfare by attacking the so called “fabulously wealthy” and supposedly sticking up for the lowly paid. Labor has tried to place considerable spin on the Liberals plans to end funding for the Low Income Super Contribution (LISC). For those of you that are not familiar with the LISC, it is a government super payment to help low income earners save for their retirement. The LISC is 15% of the concessional (before tax) contributions you or your employer makes from 1 July 2012. The maximum payment you can receive for a financial year is $500 and the minimum is $20. The LISC is meant to be funded by the receipts of the almost useless Mineral Resources Rent Tax, more commonly known as the Mining Tax , or as I like to call it the little tax that wasn’t. I call it this because the Mining Tax that Julia Gillard negotiated herself after Wayne Swan stuffed up the first version prior to the 2010 election has not delivered the rivers of gold that Labor promised and it actually costs more to implement than it brings in. The backdown from Swan’s original version was one of the main catalysts for Labor deciding to knife deposed Prime Minister Kevin Rudd, but that is another story for another day so let’s get stuck into the 5 things that Labor don’t want you to know about the Low Income Super Contribution (LISC) scheme. The Liberals position is pretty simple given Australia’s substantial debt position. If the tax that was meant to pay for the LISC doesnt generate any money, then the programs it was meant to support need to be removed. It’s simple case of balancing a budget, just like most households do every month or year in order to get by. Or if you don’t have a budget of your own to balance, it’s just like the game of Monopoly – NO MONEY IN, NO MONEY OUT. If you promise something to someone on the provisio that it is dependent on something else, which doesnt materialise because of poor management, then it might be impossible to deliver wouldn’t it? it’s common sense, but that isn’t what Labor focuses on is it? No, they run with the class warfare angle that Liberals want to take from the poor. Since 1 July 2003, the Australian Government has provided the incentives of a government funded co-contribution for lower income employees who make personal contributions to their own superannuation fund. And guess who was in power in 2003. The LIBERALS. It was John Howard and Peter Costello that initiated the Low Income Super Contribution, not Labor. So it was the Liberals who actually initiated contributions to the superannuation of those working in low paying jobs. Another thing that Julia Gillard, Wayne Swan and Bill Shorten don’t want you to know about the LISC is after Labor got into office in 2007, THEY LOWERED the LISC from the level that John Howard’s Liberals established it at in 2003. The amount was lowered by $500 so that the maximum low income earners could obtain was $1,000 (up to and including FY 2012). Don’t worry, it gets better as most Labor spin stories do when you start to scratch the surface to examine where the the all-to-present fetid stench of ineptitude emanates from. The kicker is that Labor will once again lower the LISC for the 2014/15 financial year. This is the second such reduction of the LISC by Labor. Not only will the maximum entitlement now be reduced to just $500 (down from the $1,000 offered in 2007), there will also be a reduction in contribution matching rate from 100% to 50%. So this means to get the $500 in 2014/15 financial year, low income earners will need to contribute $1000 as opposed to the dollar for dollar contribution of the Costello / Howard years. People who earn the low incomes that qualify for the LISC (no more than $37,000 p.a), will NOT have any meaningful superannuation when they retire. Almost certainly, all of these people will be wholly dependent on the Aged Pension, which the government provides them courtesy of the Australian taxpayers. Next time you hear Gillard, Swan and Shorten, or any of the pack of lying miscreants that represent the Australian Labor Party start talking about how Tony Abbott is going to take money away from the lowly paid just think back to this post. Labor have removed 2/3’s of the contribution that the Liberals initiated when they were in office. When you are ever confronted with a post on Facebook by one of their economically challenged supporters telling you just how bad AbbottAbbottAbbott is, just tell them these simple facts. The amount that Labor bangs on about is only a third of the amount originally provided to low income earners by the Liberals in 2003 under John Howard. These are the facts about the Low Income Super Contribution scheme, not some factually incorrect, piss poor photoshop slide posted on Julia Gillard’s Facebook page. 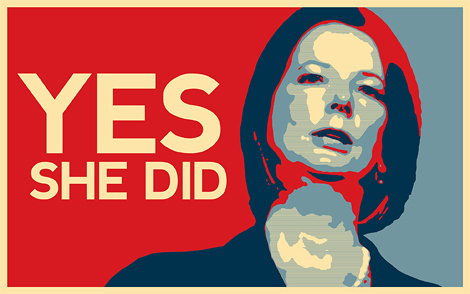 Labor – We are us – Moving forward in politics by misrepresentation since 2007.